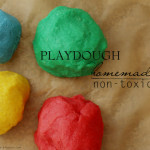 Homemade playdough that is safe and non-toxic. Combine flour, cream of tartar, vegetable oil and salt into a pot. Mix food color into 1 cup of hot water and add to pot. Cook the mixture over medium heat and stir frequently for a few minutes. When the mixture becomes the consistency of dough and is well blended, remove the pot from the heat and let the dough cool off for a few minutes. Once it has cooled and ok to touch, place the dough on a layer of wax paper and knead it into a large ball. Repeat the process for all colors.